As a kid, I loved playsets. Dinosaur ones. Western ones. Exploding bridges. Playsets were just super cool. Military playsets were always my facorites though, because I could use my firecrackers from the 4th of July to “enhance” the experience. I didn’t have this playset but I am sure I would have loved it if I had. The set has 145 action filled parts and a cool looking set to act out all sorts of battles. The dealer selling this particular toy only wanted $20 for it, and it was in awesome shape, but it was MASSIVE! So even at $20 they couldn’t sell it. Yea, I’m just over 1 year late on this, but dam. I would have bought it for $20. Just found this tank at Target, but the price is nuts! wow, I just looked this up as a lark- was one of my favorite toys as a kid in the early 80s. I had the “mountain” around for years, probably until I was in middle school. I remember getting up christmas morning and finding it and going ape. I was just talking with someone about this. I too had this very playset… and like gfunk, got it for Chirstmas! All we knew was it was a HUGE box and who was it for… then it was me, and opening it up was just awesome. Of course, you take the mountain away and all the contents could have fit into a shoebox with room left over. But that mountain was cooooool. Wow. Looked this up as a spur of the moment thing as well and found this site. I too grew up with the Anzio mountain. What Iloved about this set was that the tan German guys looked diferent from all the other “tan” figurines. Heck, for that matter I think even the green U.S. “army men” were in unique poses compared to the more classical designs. For some reason the cream colored german tanks always made me think of the N. African battle in “Patton” against the Afrika Korps. I’m pretty sure I got this as a birthday present when I was in 1st grade. I still remember the landing craft and playing with it in our hallway that evening – with army men spread out all over the floor. Ah, to be yong again! I wish they made playsets like this for my kids today. 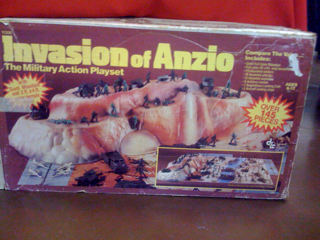 We had an Iowa Jima, Guns of Navarone, a Fort Apache, and this Anzio set. I was just reminded of this while watching :The Day the Earth Stood Still”(when Bobby mentions his dad dying at Anzio) and stumbled across this site. I got it for Christmas in ’83 or so…the box was HUGE! I eventually blew up, melted, etc all the pieces and left the mountain out in the woods as part of a continuous war with transformers and star wars guys lol. Totally woulda bought this for $20!